For those of you who want a faster, easier way to spend a lot of money on fast food, all without having to leave the comfort of your home, then Seemless Web is about to be your best friend. Seemless Web just launched a new mobile app for the iPhone and Blackberry devices. Seemless Web for Android devices is coming soon. 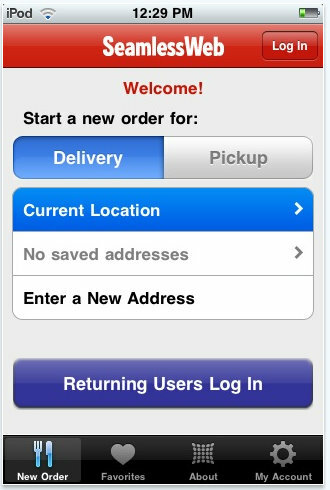 Place orders for delivery or takeout from the full menus of restaurants in your area using your iPhone or iPod Touch. With SeamlessWeb’s free app [Beta] you can order food from restaurants in New York City (Manhattan, Queens, Brooklyn), New York Metro (Hoboken, Jersey City, Stamford, Greenwich), Washington DC, DC Metro (Arlington, Bethesda, Chevy Chase), and select areas within San Francisco, Chicago, Boston, Philadelphia, and Los Angeles. No fees, no cash, no hassle—just the simple, easy ordering you’ve always enjoyed online at SeamlessWeb.com. Use your GPS location or your address to browse restaurants in your area. Select a restaurant, customize and add menu items to your order, and check out using your personal credit card—no cash required! Your order is instantly transmitted to the restaurant, which then prepares your meal for delivery or pickup. Although the Seemless Web website doesn’t mention the iPad, I’m assuming that app from iTunes will work just as well on the iPad as it will on the iPhone. Does anyone have more info about Seemless Web working on the iPad? If the app isn’t yet compatible for the iPad, I’m sure it’s only a matter of time before we see Seemless Web come to the ipad. So what do you think about Seemless Web launching their own apps for iPhone, Blackberry, and Android (coming soon). Read more about Seemless Web here.